The world’s best ham is the super-premium jamón Iberico de Bellota. Acorns are key to its flavor and marbled fat. Artisan producers contribute generations of tradition to the curing process. But it’s Spain’s very own black pigs (that can’t stop eating) that keep the breed in the royalty category of gastronomy. Over 300 windows are manually opened and closed several times a day at the Arturo Sánchez e Hijos factory in Guijuelo, Spain. It’s a tradition that dates back three generations. Even the company president participates. He instinctively knows the airstream from nearby Sierra de Gredos and Sierra de Béjar mountain ranges is essential to cure the brand’s artesano hams. They hang nearby, dangling off hooks, and are identifiable by their pata negra (black hoof) as a gold standard of Spanish gastronomy. Each ham has been rubbed with sea salt and does not touch the one beside it, which allows the wind to circulate on all sides of the meat. This process creates the prized jamón Iberico de bellota, one of the most expensive pork meats in the world. It’s equally known for generous fat deposits between the muscle fibers, and can take up to four years to cure in the company’s natural drying rooms. “They were happy pigs once, roaming free and eating acorns, berries and natural products,” Elisa Cancio said with a smile. As the company’s marketing representative, she knows first-hand the skills needed to produce Spain’s coveted delicacy. 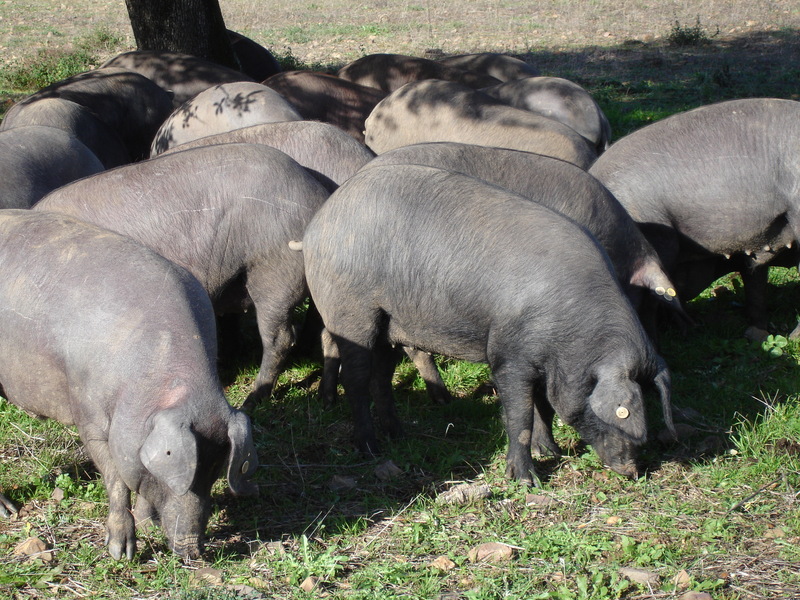 “We use 100% Iberian pigs, born and raised in the dehesa (oak forests) for up to twenty-one months,” she continued. The Cerdo Ibérico strain of pig is only found in Spain and dates back to the cavemen. Located in western Spain, which includes Salamanca, Extremadura, Andalucia and along the border of Portugal, the dehesa is dotted with holm oak and cork oak trees. During the montanera, which occurs from October through March, the Iberian pigs devour huge quantities of the fallen bellotas (acorns) as they roam freely across the land. In their earlier growth stages, they are raised on grasslands and grains. Of the millions of Iberian pigs raised throughout Spain, only six percent are purebred and acorn-fed. It’s a heavily regulated industry. In fact, the towns of Guijuelo and Jabugo have their own Denomination de Origen due to their consistent high quality. The Arturo Sanchez quality control team handpicks each pig to carry their label, about 1,000 hams per year. Choices are all about the breed and the pig’s structure. The Ibérian pig has dark skin with a sparse coat, a pointed snout and long, slender legs. 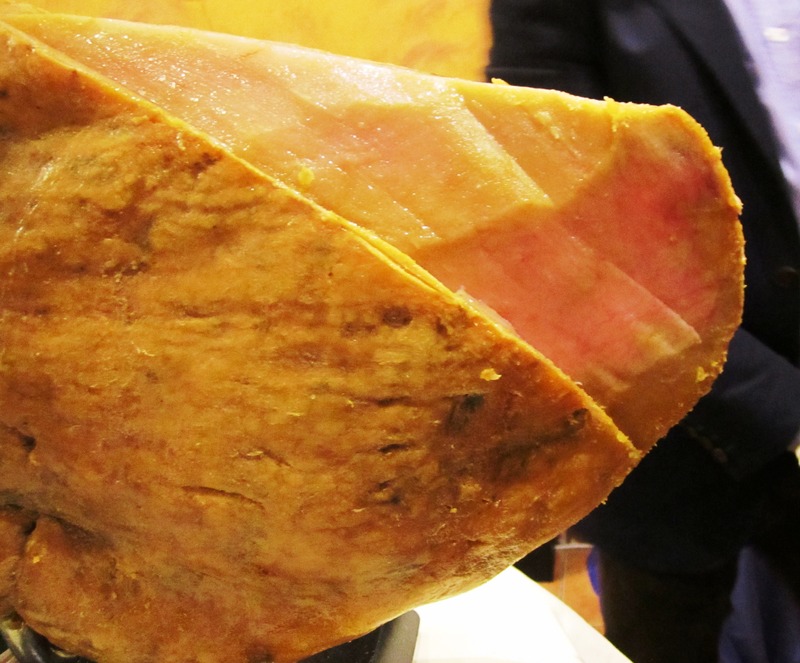 The cured ham leg typically weighs seven kilos, although some have weighed in around eleven kilos, when sold to the consumer. Many producers prefer to sacrifice their pigs and not slaughter them after one montanera phase. The Arturo Sánchez brand, however, waits through two phases for the black pigs to fatten. They gain about half their weight during their acorn-grazing time, creating a unique and nutritious fat around the muscle. “These hams are good fat to eat. Even Michelin chefs fall in love with our fat,” Cancio said with assurance. “A lot of it comes from the acorns.” The color of the fat is different. It’s slightly pink. The wafer-thin slices are served at room temperature with the meat and its surrounding fat glistening on the plate. Studies support the good-fat-to-eat theory associated with jamón Iberico de bellota and its oleic acid content over 55%. That amount increases the good HDL cholesterol and reduces bad LDL cholesterol in the blood. Only virgin oil has higher oleic acid content. 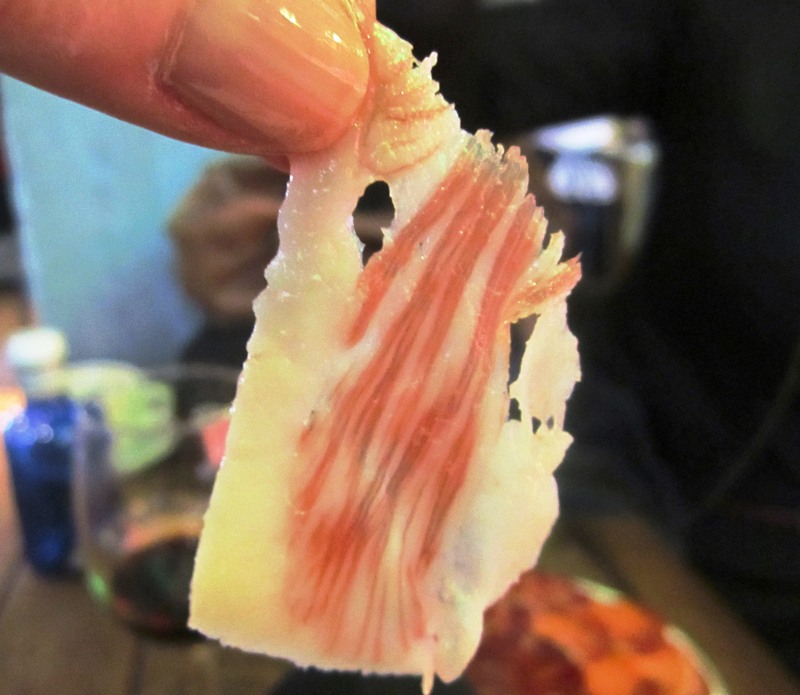 “This is how to eat jamón Iberico de bellota?” Cancio said, as she carefully lifted a small shimmering sliver of the meat marbled with and encased in succulent fat. “First you smell it,” she said and placed the slice under her nose. “You’ll notice the nutty aroma, which prepares your mouth to accept the jamón. Then you put the slice against the top of your palate so the fat gets a temperature to melt properly. Don’t chew and swallow immediately. It’s a slow food,” she said while seated at the Arturo Sánchez stall in Madrid’s San Ildefonso Street Market, located at Calle Fuencarral, 57. It’s one place where the brand can be tasted, including its ham and other products they make. “It’s like peeling an orange. For the first slice to be good, we throw away a lot of outside fat,” said Jose Ignacio González Diaz-Tendero, director of sales at Gondiaz. Their showroom at Plaza de la Marina Española, 7 specializes in several top brands of jamón Iberico de bellota and provides ham-slicing courses for the trade and for the general public. Next door is La Mi Venta, the restaurant where the family began their ham journey seven generations ago. 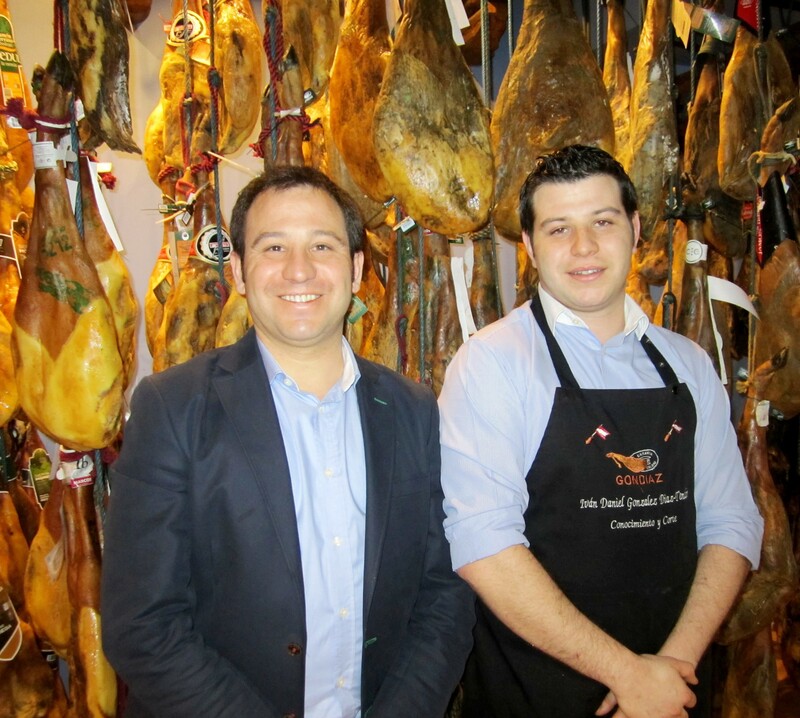 Its patriarch was one of the first restaurateurs to introduce jamón to Madrileños. It was 1962 and he’d drive to small towns in southwest Spain, purchase a few cured ham legs to hang in his restaurant, eventually to serve to his customers. Some people bought the cured leg right off the hook. In time, Gondiaz grew to have its own brand named Jamón de Autor, which comes from the Arturo Sánchez e Hijos factory in Guijuelo, Spain. Two requirements must be met: if the pig has eaten a lot of acorns and checking the cured ham’s fat content, which is done the way it’s been done for centuries in Spain. In another room at Gondiaz, tables are set with a ham holder and sharp knives to learn the art of carving the ham. Iván González Diaz-Tendero, advises to cut in parallel with the bone and in a small area, like operating on a patient. “We teach how to get as much good ham as possible,” he said referring to the Master Class the establishment offers. What’s important for him to know is how long the client intends to keep the ham. A restaurant uses a full leg or shoulder in about three days. For consumers, the same ham can last one or two months. There’s no expiration date on a whole piece, however, once the cut has been made, the drying process accelerates. “Worst mistake is to put cut ham in the refrigerator or out on a balcony. The fat becomes hard,” he cautioned. In addition to whole legs and shoulders, Gondiaz sells vacuum-packed portions in their store that Spanish law recommends be used in three months. After that, the ham’s color darkens and the flavor vanishes a bit. Across Spain, jamón is readily available. For the inexperienced palate, especially for the tourist who’s heard about the product but doesn’t understand quality levels, the Spanish government has begun putting new regulations in place. They require labels to list the percentage of Ibérico genetics in the breed and be equally clear about their pigs’ provenance. Imagery of the dehesa can’t appear on the package if the pig wasn’t raised there. The least expensive ham is “jamón serrano.” That pork meat comes from white pigs; fed only grain and is cured for a year. “Jamón Iberico” comes from black Iberian pigs. They, too, have eaten grain but because of the Iberian breed, there is a richer flavor than “serrano” white pigs. The best and most expensive is “jamón Iberico de bellota.” That black pig has been bred, nurtured and sent to the “bellota” (acorn) pastures for the final stage of its life. Its cured meat is a mixture of intense flavors and healthy fat. Depending upon the consumer’s country of origin can dictate if Spain’s finest product can be brought home after a visit to Spain or purchased locally. Internet sites offer the costly jamón Iberico de bellota plus the utensils to cut them properly, making it possible to enjoy Spain’s ultimate status symbol on any table worldwide. Judith Glynn has been hooked on writing travel articles for 25+ years. She began the ultimate journey writing for newspaper travel sections, mostly about travel shopping. Spain is her favorite place. But each new destination turns on her intuitive curiosity to find details and subjects that not only set the place apart but lead to Judith’s articles enriching a reader’s enjoyment. She's the author of A Collector of Affections: Tales from a Woman's Heart (novel) and The Street or Me: A New York Story (memoir). Judith loves life, all of it. She resides in New York City and Rhode Island where she enjoys an eclectic lifestyle in both places. She’s a member of the International Food, Wine and Travel Writers Association and the Association of Rhode Island Authors.